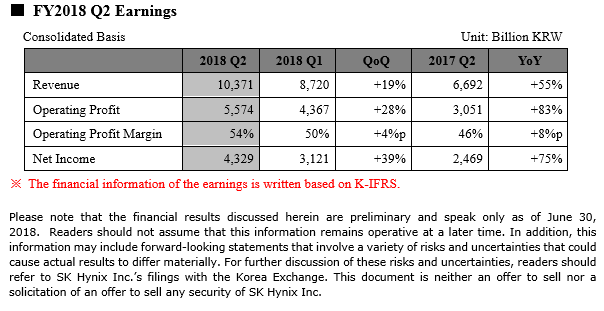 Seoul, July 26, 2018 – SK Hynix Inc. (or ‘the Company’, www.skhynix.com) today announced financial results for its second quarter 2018 ended June 30, 2018. The consolidated second quarter revenue was 10.37 trillion won while the operating profit amounted to 5.57 trillion won and the net income 4.33 trillion won. As a result, the Company has set all-time high figures in quarterly revenue, operating profit and net income. Favorable market demand continued during the second quarter and the Company’s shipments of DRAM and NAND Flash significantly increased. Consequently, the revenue and the operating profit rose by 19% and 28% compared to the previous quarter. Quarter-over-quarter, DRAM bit shipments increased by 16% as the Company actively responded to robust server and PC DRAM markets. The average selling price rose by 4% through evenly increased price for all DRAM product categories. For NAND Flash, the bit shipments increased by 19% mainly thanks to growing SSD demand and an ascending trend of NAND density in Chinese mobile phones. The average selling price was lowered by 9% due to supply growth of the industry. SK Hynix will place its focus on expanding leading edge technologies to mass production to respond to the market demands. Therefore, it will consistently expand the portion of 1Xnm mainly in the sales of server and mobile DRAM, which are expected to have strong demand growth. The Company also plans to stretch its cutting-edge 72-Layer 3D NAND and make efforts to smoothly supply high density mobile solutions and enterprise SSDs. Meanwhile, SK Hynix will complete the cleanroom construction of the new FAB in Cheongju by the end of this September. Considering the equipment setups in the cleanroom, the new FAB is expected to contribute to the Company’s production capacity from the beginning of the next year. In addition, the cleanroom space expansion at Wuxi FAB will be completed by the end of this year as planned.